The key to the success of this dish to to make sure your oven is HOT and stays that way throughout the cooking process. Also make sure you don’t crowd the carrots on the baking sheet as this will affect the roasting process. In a bowl, combine the honey and brown sugar. Microwave for about 15 seconds. Just enough to melt the honey. Spread in an even layer on the baking sheet. Roast for 15 minutes. Remove tray and keep the oven door closed to retain heat. 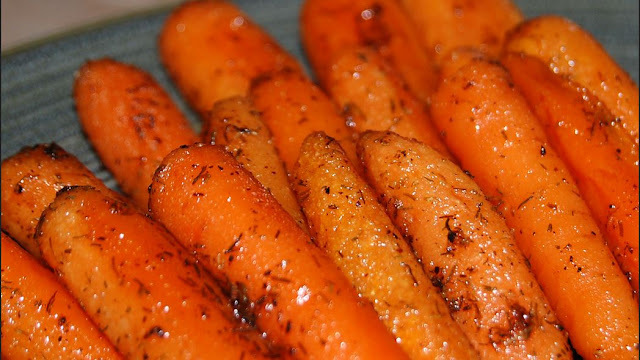 Using tongs, turn the carrots over and return to the oven for another 30 minutes or until they start to carmalize. 2 PP per serving To get my carrots to look the way they do, I purchased Petites Carottes Epluchees (Peeled Baby Carrots. They come in 8 ounce bags.